It’s April and all this sunshine makes the pace of life pick up, giving us a taste of the Alaskan summer chaos that is sure to come! Club Sports Alaska wants to make it easy and convenient to keep your kids active during the week. 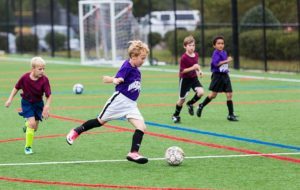 With family-first scheduling, we keep your schedule simple by guaranteeing that all your children will play on the same night, at the same site, at the same time. No more being a chauffeur and having to choose which child you get to stay with and cheer on. We offer co-ed soccer programs designed for ages 4-15 years. The first thirty minutes of the 75-minute-long session is a practice session. Coaches work on skill building. The other half is set-up for scrimmage play with two 20-minute halves and a five-minute half time break. Season 1 is from May 28-July 3 and season 2 is from July 15-August 14. We play mostly on Monday and Wednesday evenings, keeping those precious summer weekends free for family adventures. Spots are filling up quickly so don’t wait to register. If you have any questions, don’t hesitate to call or email Caleb at (907) 529-6195 or caleb@clubsportsalaska.com. We look forward to seeing you out on the field!